Edmunds Inside Line coordinated this two dyno one day session with the J Spec Connect. com R35 GT-R.
Daryl Alison of JSpecConnect.com and Kaizo Industries brought the first two Nissan GT-Rs into North America. It wasn't easy, and only a longtime GT-R fanatic would undertake it. First, Alison imported two complete right-hand-drive R35 GT-R bodies ("drivetrain delete," read the order form) to California. Then he mated them to two R35 GT-R drivetrain assemblies that he secured from independent sources and imported separately. It's not the easiest way to get a GT-R in this country, but it is the quickest and it's legal. As we discovered in Inside Line's exclusive first test in Japan, the 2009 Nissan GT-R will rocket to 60 mph in just 3.3 seconds and blow through the quarter-mile in 11.6 seconds at more than 120 mph. This makes the GT-R R35 the quickest accelerating production vehicle we have ever tested. Quicker than any Ferrari. Quicker than any Corvette. Quicker than any Viper. 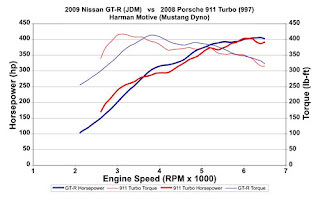 And quicker than the Porsche 911 Turbo that was the yardstick against which Nissan measured all aspects of the GT-R's performance during its development.